Paddle in the quiet waters near South Beach Harbor and Mission Creek in San Francisco. You will paddle under draw bridges and McCovey Cove next to AT&T Ball Park. The trip starts with gearing up, briefing, and instructions. You will explore on the water for 1 to 1.5 hours and the total event time is 2 hours. This kayaking session is suitable for anyone, including the first time paddlers and families. No paddling experience is required, and beginners are welcome. 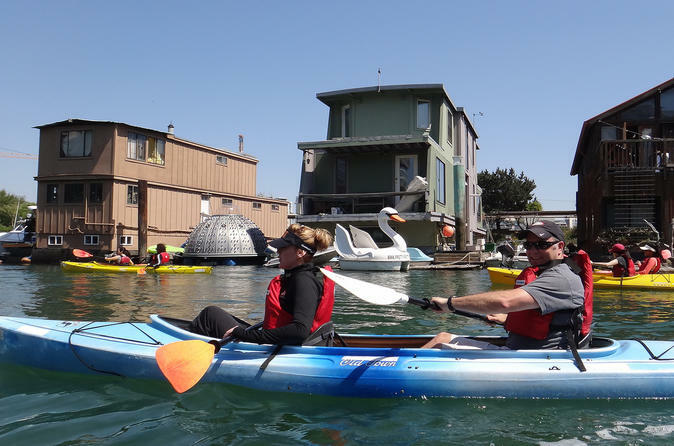 After briefing about the area and learning to maneuver a kayak, start your adventure in the quiet waters near South Beach Harbor and Mission Creek. Your guides will be on the water to lead the way and give you helpful tips. You'll be provided with an easy to use extra stable touring kayak. These are typically more fun for beginners. Double kayaks are available if you want.